Ships tomorrow if you order in the next 20 hours 4 minutes. 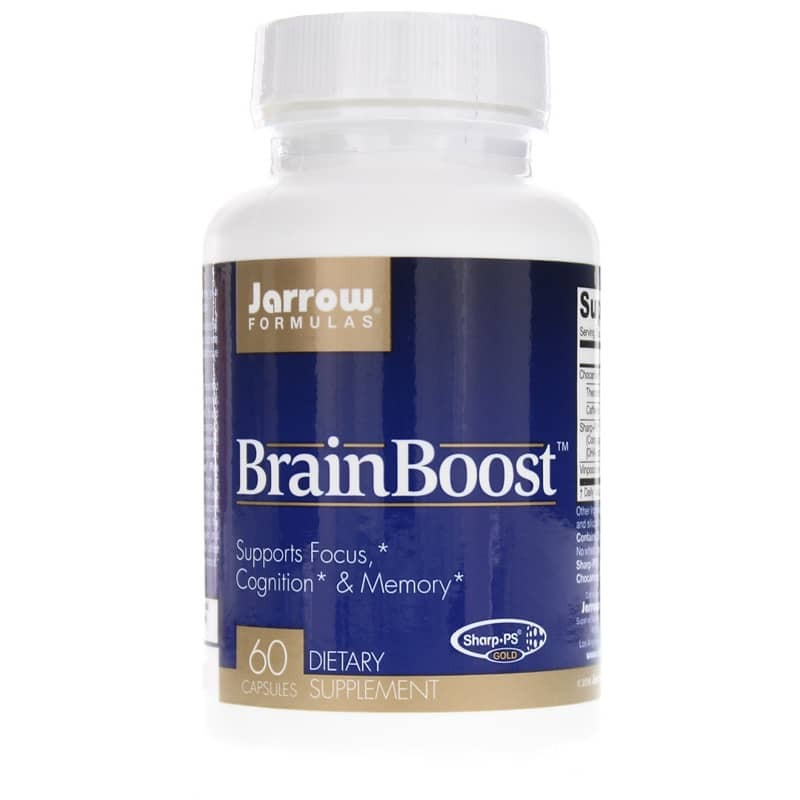 BrainBoost by Jarrow Formulas offers comprehensive memory, focus and cognitive support from Sharp-PS Gold, a unique form of phosphatidylserine bound to DHA, ChocoMind theobroma cacao extract and Vinpocetine. Sharp-PS Gold - phosphatidylserine bound to DHA (omega-3 fatty acid); an active form of PS which may help support normal neurotransmitter function. ChocoMind - Chocomine Plus theobroma cacao (chocolate) extract, rich in theobromine and caffeine, which may assist cognitive function and reaction time. 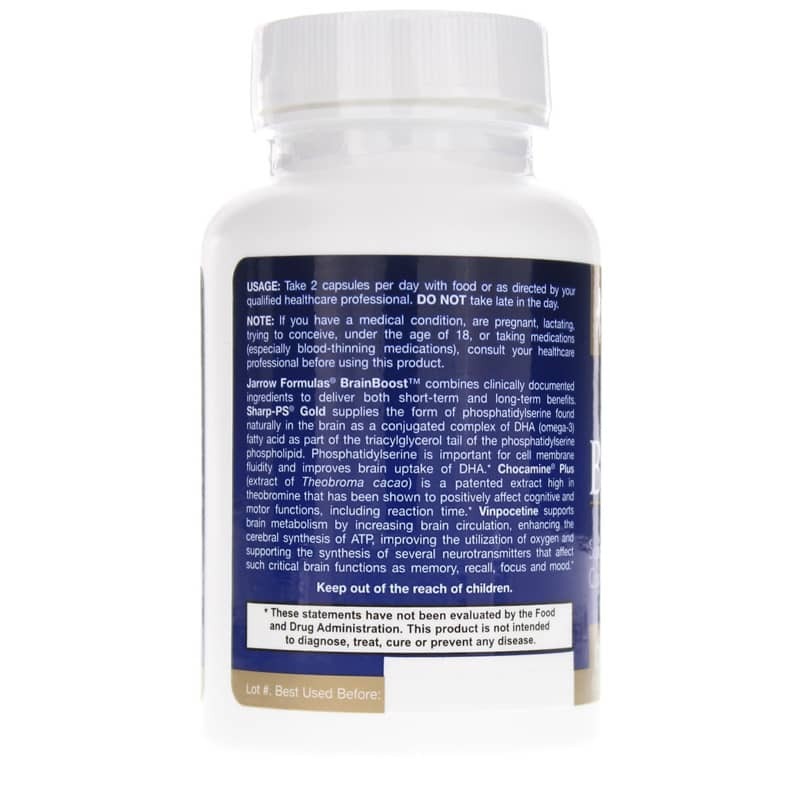 Vinpocetine - this substance, derived from the Periwinkle plant, may help support brain circulation, oxygenation and ATP production. 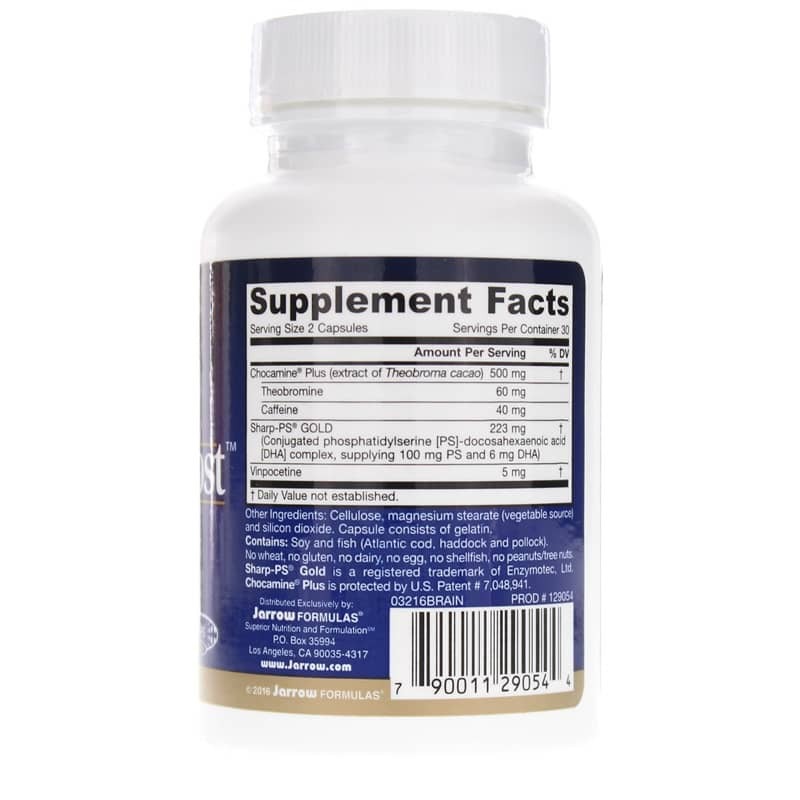 Use as a dietary supplement to assist short and long term memory, improve focus and promote normal cognitive function. Adults: Do not take late in the day. Take 2 capsules per day, with food, or as directed by your healthcare practitioner. Other Ingredients: Cellulose, magnesium stearate (vegetable source), and silicon dioxide. Capsule consists of gelatin. Contains: Soy and fish (Atlantic cod, haddock and pollock). Contains NO: wheat, no gluten, no dairy, no egg, no shellfish, no peanuts/tree nuts. Adults: Take 2 capsules per day with food or as directed by your qualified healthcare consultant. DO NOT take late in the day. If you have a medical condition, are pregnant, lactating, trying to conceive, under the age of 18, or taking medications (especially blood-thinning medications), consult your healthcare practitioner before using this product. Keep out of the reach of children.